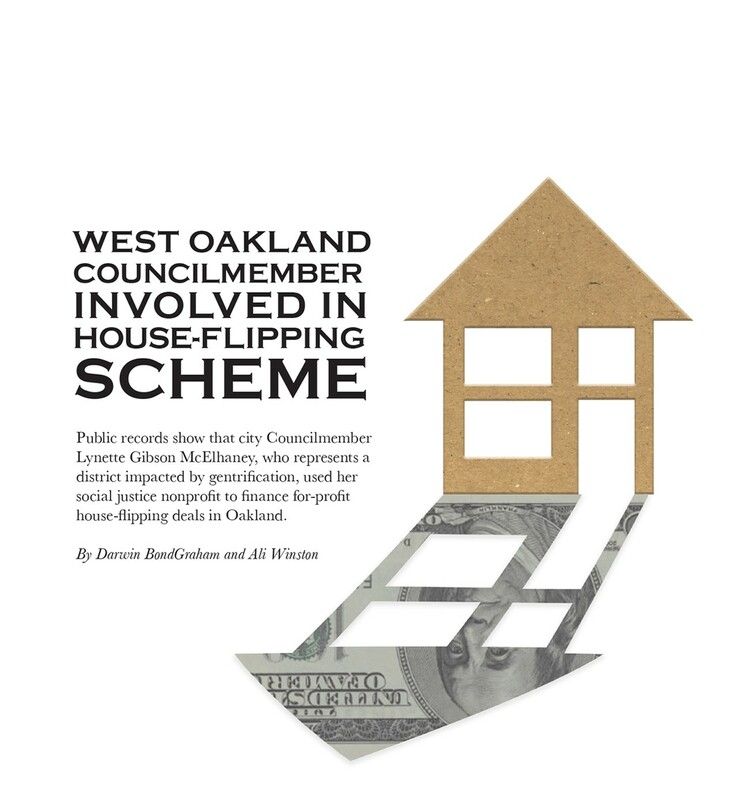 Public records show that city Councilmember Lynette Gibson McElhaney, who represents a district impacted by gentrification, used her social justice nonprofit to finance for-profit house-flipping deals in Oakland. 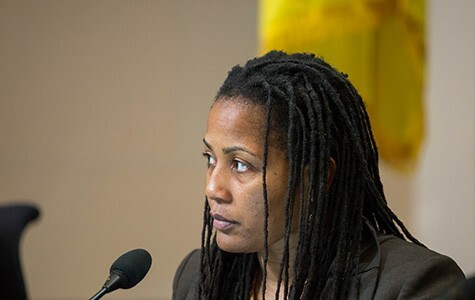 During the 2012 campaign for Oakland's District Three council seat, Lynette Gibson McElhaney said affordable housing was one of her top priorities, and that if elected, she would work to prevent gentrification and displacement of low-income residents. 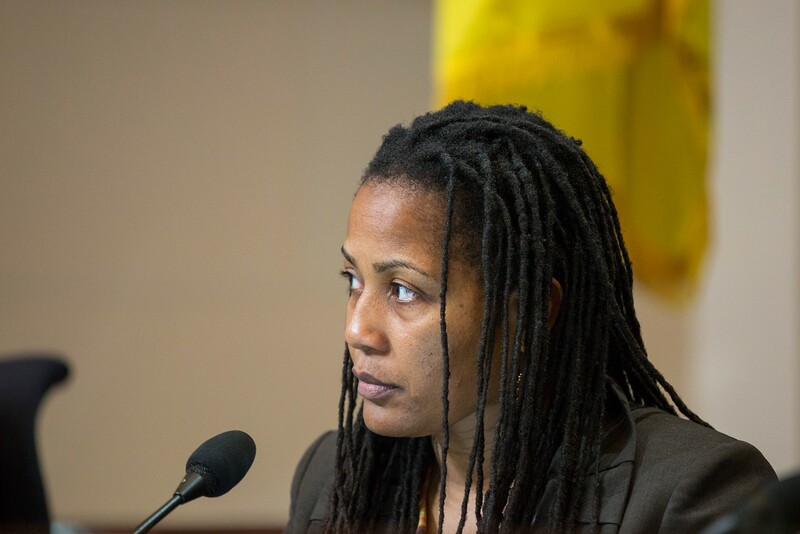 Since 1996, she has run a nonprofit housing assistance organization based in Richmond, and during the 2012 campaign, she said her job made her well-qualified to be a city councilmember. At a candidate forum in July 2012, Gibson McElhaney even issued a warning about for-profit speculators who seek to profit from Oakland's volatile housing market. In response to a question about how to maintain affordable housing, she said it was important to make sure "we don't allow carpetbaggers to come into the community. We have lots of affordable inventory right now created by an economic crisis that we didn't have anything to do with. We've got 30 percent of our units vacant and we've got investors who are coming in here and swallowing these up." And since taking office, Gibson McElhaney has been outspoken about Oakland's affordable housing needs. "I firmly believe that the city needs to commit funding to affordable housing, to infrastructure development, and to other strategies to address the serious displacement problem," Gibson McElhaney said during a July 15 city council meeting, referring to the displacement of longtime residents who can no longer afford to live in the city. At the same meeting, Gibson McElhaney, who represents downtown and West Oakland on the council, complained again about the impacts that speculators have had on Oakland's housing situation: "Many of the things that have us in pain about displacement, about rising rents, those things are happening now because there's uncertainty in the marketplace, and because there's wildcat speculation." Yet despite Gibson McElhaney's rhetoric on gentrification and displacement, our months-long investigation reveals that she used her nonprofit housing assistance corporation to take part in some of the same "wildcat speculation" that she has condemned. 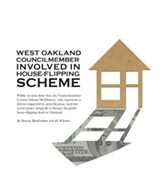 Records show that beginning in March 2013, just two months after she was sworn in as an Oakland councilmember, Gibson McElhaney used her nonprofit, Richmond Neighborhood Housing Services, to lend at least $225,000 to an investor engaged in house-flipping transactions in Oakland. Records and interviews also show that the loans, which earned Richmond Neighborhood Housing Services considerable interest and fees, had nothing to do with creating affordable housing for Oakland residents. Rather, the flipped properties ended up in the hands of landlords and homeowners who bought them at market rates. Furthermore, in at least one of the deals, Gibson McElhaney's sister, Andrea Gibson Nobles, invested alongside Richmond Neighborhood Housing Services and made money off the transaction. Gibson McElhaney's dealings raise numerous legal and ethical questions, including whether Richmond Neighborhood Housing Services has violated its tax-exempt status by engaging in for-profit activities, and whether deals that included her sister violated the organization's conflict-of-interest rules. Gibson McElhaney's house-flipping deals also contradict her claims that she's concerned about low-income Oakland residents being squeezed out of the housing market. The deals occurred at a time when soaring housing prices and rents have caused a crisis of affordability for many residents — a crisis made worse by shadowy investors, including those that Gibson McElhaney has done business with. In a letter responding to our findings, Gibson McElhaney didn't dispute any of the facts presented in this report, although she maintains that she has done nothing wrong. In a separate letter, the president of Richmond Neighborhood Housing Services' board of directors, Maxine Reynolds, said the board "has no knowledge of any activities or behavior on the part of the Executive Director Lynette Gibson McElhaney that would be considered improper or illegal." 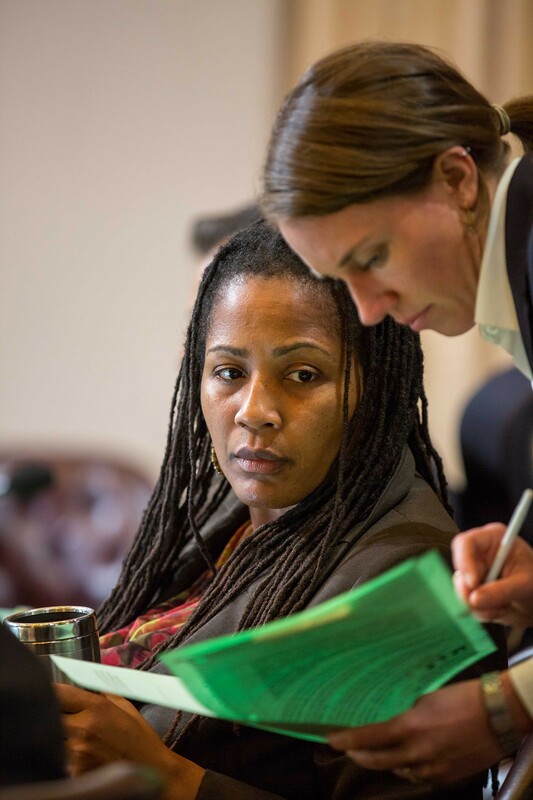 Lynette Gibson McElhaney's involvement in house-flipping deals appears to have started in March 2013 when, through her nonprofit, she lent $75,000 to a secretive company named Nakatoma Acquisitions, LLC. Nakatoma Acquisitions then used the money to purchase a duplex with dual addresses: 5800 Ayala Avenue and 592 Martin Street (the house sits on the corner of Ayala and Martin, and for the purposes of this report, we will refer to it as the Ayala house). 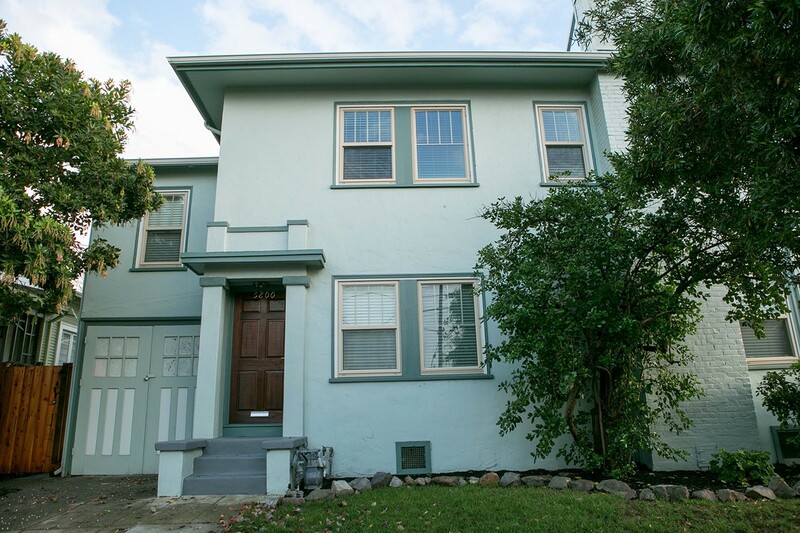 The Ayala house is just a few blocks from the Rockridge BART Station in Oakland. According to public records, Nakatoma Acquisitions bought the Ayala house for $478,000 from its previous owners, and then turned around and listed the house for sale at $849,000 in October 2013. 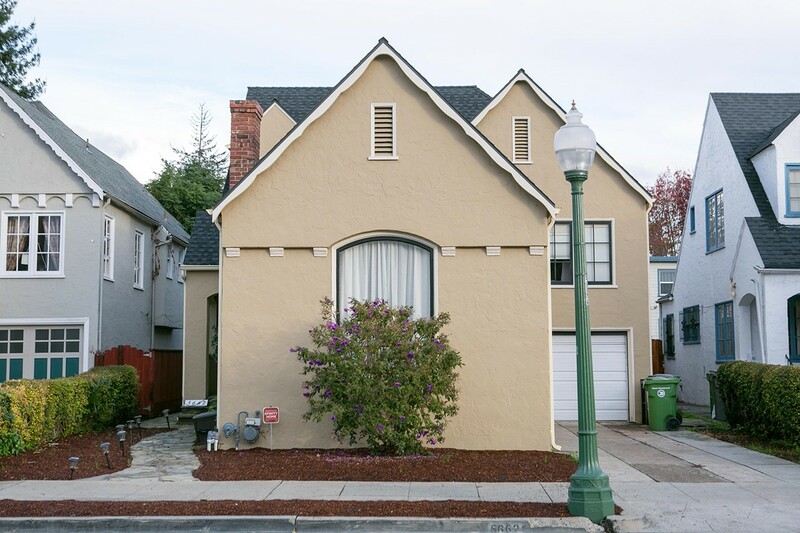 The Ayala house sold in January 2014 for $888,000 to a Berkeley couple. We could find no evidence that the Berkeley couple plans to rent out the two-unit house as an affordable dwelling. The couple didn't respond to repeated phone calls seeking comment for this report. During a recent visit, both units in the Ayala house appeared to be uninhabited. Richmond Neighborhood Housing Services, which recently changed its name to East Bay Neighborhood Housing Services, made a lot of money by helping Nakatoma Acquisitions flip the Ayala house. According to escrow documents we obtained, and records on file at the Alameda County Recorder's Office, Gibson McElhaney's nonprofit was paid a $35,000 "exit fee" along with $6,550 in interest when the property sold. Gibson McElhaney told us in an email that her organization has earned a total of $49,000 on all of the loans it has made to Nakatoma Acquisitions to date, but she didn't break down earnings for each different loan. Gibson McElhaney's sister, Andrea Gibson Nobles, also profited from the deal. According to escrow documents and public records, Gibson Nobles made a separate loan of $37,500 to Nakatoma Acquisitions as part of the financial package that allowed the company to purchase or renovate the Ayala house. When the duplex sold, Gibson Nobles got back the $37,5000 she had loaned to Nakatoma plus $7,191 in interest. Andrea Gibson Nobles did not respond to multiple phone calls and emails seeking comment for this report. Are Police Taking the Violent White Supremacist Gang Threat Seriously? Berkeley police declined to say whether they view neo-Nazis as gang members. Court-Appointed Monitor Who Oversees Oakland Police Department Could Have Blocked Controversial Promotions — but He Didn’t. Robert Warshaw has the power to demote high-ranking officers and even fire the police chief.